We investigated the relationship between ICOS, CD28, CTLA-4, and IL-2 to gain a better understanding of this family of costimulatory receptors in the immune response. Using magnetic beads coated with anti-CD3 and varying amounts of anti-ICOS and anti-CTLA-4 Abs, we show that CTLA-4 ligation blocks ICOS costimulation. In addition to inhibiting cellular proliferation, CTLA-4 engagement prevented ICOS-costimulated T cells from producing IL-4, IL-10, and IL-13. Both an indirect and direct mechanism of CTLA-4’s actions were examined. First, CTLA-4 engagement on resting cells was found to indirectly block ICOS costimulation by interferring with the signals needed to induce ICOS cell surface expression. Second, on preactivated cells that had high levels of ICOS expression, CTLA-4 ligation blocked the ICOS-mediated induction of IL-4, IL-10, and IL-13, suggesting an interference with downstream signaling pathways. The addition of IL-2 not only overcame both mechanisms, but also greatly augmented the level of cellular activation suggesting synergy between ICOS and IL-2 signaling. This cooperation between ICOS and IL-2 signaling was explored further by showing that the minimum level of IL-2 produced by ICOS costimulation was required for T cell proliferation. Finally, exogenous IL-2 was required for sustained growth of ICOS-costimulated T cells. These results indicate that stringent control of ICOS costimulation is maintained initially by CTLA-4 engagement and later by a requirement for exogenous IL-2. The prototypical costimulatory molecule, CD28, provides a strong mitogenic signal (1, 2), induces a large array of effector cytokines (3), and up-regulates cell survival genes such as Bcl-xL (4). Equally important for an effective immune response, CD28 costimulation promotes long-term growth of CD4 T cells (5, 6). Whereas CD28’s role is to strongly enhance the T cell response to pathogens, other cell surface molecules serve to down-regulate the immune response. CTLA-4, a CD28 family member, delivers a negative signal to T cells, limiting their activation (7). The most striking data revealing CTLA-4’s negative role in T cell proliferation are seen in mice that have a germline disruption of the CTLA-4 gene. These mice die of a massive CD4 T cell lymphoproliferative disorder (8, 9, 10). In vitro, microspheres coated with Abs against CD3, CD28, and CTLA-4 have been useful tools for studying the roles these molecules play in the immune response in both human and murine models (11, 12). Using this approach, we have shown that CTLA-4 could block CD28-mediated proliferation, IL-2 production, and CCR5 down-regulation but not Bcl-xL induction (13, 14). ICOS (AILIM) is the third member of the CD28 family whose role in the immune response remains to be elucidated (15, 16). Although ICOS possesses costimulatory activity, it differs from CD28 in at least three important ways: 1) ICOS costimulation results in the increased production of IL-4, IL-5, and IL-10 but not IL-2 (15). 2) The ICOS ligand, B7RP-1 (B7h, GL50, and B7H2) is structurally related to the B7 molecules but binds neither CD28 nor CTLA-4 (17, 18, 19, 20). Likewise, ICOS does not bind either CD80 or CD86. Thus, there is no competition for ligand binding between CTLA-4 and ICOS. 3) ICOS, like CTLA-4, is induced on the T cell surface upon cell activation (15, 21). ICOS, unlike CTLA-4, does not bind CD80 or CD86 and generates a qualitatively different signal than CD28. Given CTLA-4’s proposed role as the gatekeeper to T cell activation (11), we investigated whether CTLA-4 ligation could prevent ICOS-mediated costimulation. CTLA-4 cross-linking can effectively block ICOS costimulation. The addition of exogenous IL-2 not only overcomes this block, but also greatly augments the effects of ICOS costimulation. To further explore the relationship between ICOS costimulation and IL-2, we show that IL-2 is necessary for costimulation of CD4 T cells. However, ICOS costimulation is not sufficient to sustain growth, and ICOS-costimulated T cells undergo apoptosis in the absence of exogenous IL-2. PBLs were isolated by Percoll (Pharmacia Biotech, Uppsala, Sweden) gradient centrifugation from leukopacks obtained following apheresis of healthy donors. CD4+ T cells were purified by negative selection using magnetic beads (Dynal, Lake Success, NY) as described previously (3) and were routinely >98% CD3+, >98% CD28+, and <3% CD8+ as judged by flow cytometry. The mouse anti-human AILIM/ICOS mAb, clone JMAb-52, was generated by immunizing female BALB/c mice with the membrane fraction of human AILIM/ICOS-expressing Chinese hamster ovary cells. Anti-CD3 (OKT3) (22), anti-CTLA-4 (ER5.3D6) (23), anti-CD28 (9.3) (24), anti-glycophorin A (GLY)3 (clone HB-8162; American Type Culture Collection, Manassas, VA), and anti-AILIM/ICOS (JMAb52) covalently attached to polyurethane-coated tosyl-activated Dynalbeads (Dynal) per the manufacturer’s instructions. Beads were prepared with a constant, suboptimal amount of OKT3 (12.5% of total protein coated on the beads), and various ratios (indicated in the text) of anti-ICOS, -CTLA-4, -CD28, and GLY. Polyclonal goat anti-human IL-2 Abs were obtained from R&D Systems (Minneapolis, MN). Beads were mixed with CD4 T cells at a 3:1 ratio. Where indicated, 300 U/ml of IL-2 (Chiron Therapeutics, Emeryville CA) were added to the cultures. Alternatively, cells were stimulated with 5 μg/ml PHA (Sigma, St. Louis, MO) and 300 U/ml IL-2. Cells were cultured at 1 × 106/ml as previously described (14). Cell proliferation assays were conducted in 96-well plates using 1 × 105 cells. Cultures were pulsed with 1 μCi of [3H]thymidine for 18 h before harvest. RNA was purified and reverse transcribed as described previously (14). Primers and probes to detect IL-2, IL-4, IL-10, IL-13, and 28S rRNA were designed using Primer Express software (Applied Biosytems, Foster City, CA), and their sequences are available upon request. Real-time PCR amplification and product detection was performed using the ABI Prism 7700 (Applied Biosystems) as recommended by the manufacturer. Results were normalized to 28S rRNA levels and relative expression was determined by using the ΔΔCt method according to the manufacturer’s protocol. A total of 5 × 105 CD4 T cells were incubated with anti-AILIM (ICOS) or an equivalent amount of an isotype control (BD PharMingen, San Diego, CA) for 30 min at 4°C. After being washed, the cells were incubated with a PE-conjugated goat anti-mouse Ab. Samples were analyzed on a FACSCalibur (BD Biosciences, Mountain View, CA) after gating on live lymphocytes based on a standard light scatter histogram (integral forward scatter vs log 90°). Apoptosis assays were conducted by washing 1 × 106 cells once in PBS and incubating with annexin V and propidium iodide per the manufacturer’s protocol (R&D Systems). Data were analyzed using WinMIDI software (J. Trotter, Scripps Research Institute, La Jolla, CA). To study ICOS, CTLA-4, and CD28 functional effects, we constructed artificial APCs decorated with Abs to the costimulatory receptors. We used Abs rather than natural ligands because B7-1 and B7-2 bind to both CD28 and CTLA-4. Therefore, the effect of CTLA-4 ligation on ICOS-mediated costimulatory signals was evaluated by stimulating CD4 T cells with magnetic beads containing a fixed, suboptimal level of anti-CD3 coupled with varying amounts of anti-ICOS and anti-CTLA-4. Previous data from other laboratories and ours have indicated that a suboptimal level of CD3 signaling is needed to see the antiproliferative effects of CTLA-4 engagement (13, 25, 26). To simplify nomenclature, immunobeads that contain anti-CD3 coupled with equal amounts of anti-ICOS and anti-CTLA-4 are called 5:5 ICOS/CTLA-4 beads. Likewise, beads that contained three parts anti-ICOS and seven parts anti-CTLA-4 are referred to as 3:7 ICOS/CTLA-4 beads. Corresponding control sets of immunobeads were made using GLY. Glycophorin, a nonbinding control, was chosen over a binding control because only minimal ICOS expression is observed on resting cells. Only minimal proliferation was seen by CD4 T cells stimulated with beads containing anti-CD3 and GLY (Fig. 1⇓). The addition of anti-ICOS to the beads (5:5 ICOS/GLY) greatly augmented the mitogenic response. The substitution of anti-CTLA-4 for GLY at an equal ratio to ICOS (5:5 ICOS/CTLA-4 beads) slightly inhibited proliferative responses. However, dramatic differences in proliferation were observed when cells were stimulated with beads containing higher ratios of anti-CTLA-4 to anti-ICOS (3:7 ICOS/GLY and 3:7 ICOS/CTLA-4). Similar findings were obtained using 1:9 ICOS/CTLA-4 beads, although the overall level of ICOS-mediated proliferation was reduced. These results indicate that, when present at sufficiently high concentrations, CTLA-4 engagement blocked ICOS-mediated proliferation. CTLA-4 ligation can block ICOS-mediated costimulation of CD4 T cells. Purified human CD4 T cells were cultured for 72 h with beads containing a suboptimal amount of anti-CD3 (12.5%) coupled with varying ratios of anti-ICOS:anti-CTLA-4 or GLY. 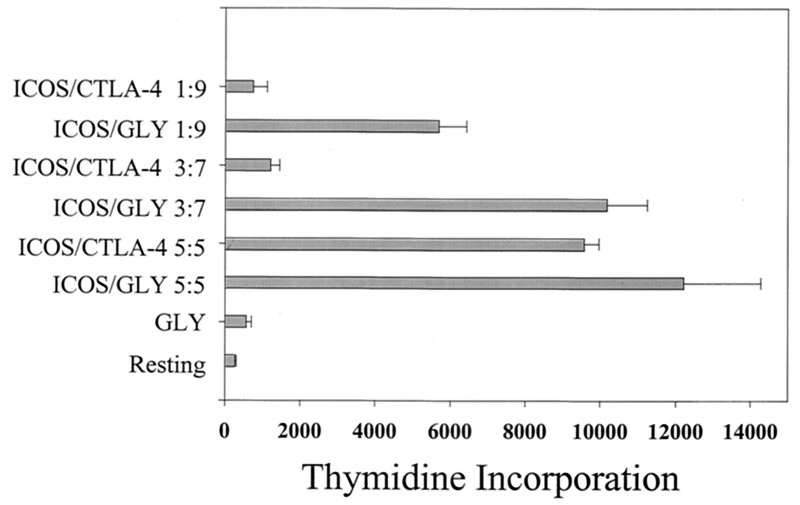 The cultures were pulsed with [3H]thymidine for 18 h, harvested, and analyzed for 3H incorporation. The error bars indicate the SD in one experiment, and the data are representative of four independent experiments. To test the effect of CTLA-4 engagement on ICOS-mediated cytokine production, we developed a quantitative RT-PCR assay to measure levels of mRNA encoding IL-4, IL-10, and IL-13. Although IL-13 was not initially described as a cytokine induced by ICOS costimulation (15), in preliminary data we found it to be highly up-regulated by ICOS costimulation. Because stimulation of CD4 T cells with 3:7 ICOS/GLY and 3:7 ICOS/CTLA-4 beads resulted in vastly different levels of proliferation, we focused our cytokine transcript analysis on cells stimulated with these beads. In cells costimulated with 3:7 ICOS/GLY beads, we noted a 10- to 20-fold increase of the transcripts encoding IL-4, IL-10, and IL-13 (Fig. 2⇓). An increase in cytokine RNA levels was not seen in cells stimulated with 3:7 ICOS/CTLA-4 beads. Similar data were obtained by analyzing the levels of IL-10 in the supernatant by ELISA (data not shown). These observations indicate that, in addition to inhibiting ICOS-mediated proliferation, CTLA-4 ligation can block ICOS-directed cytokine production. Cytokine RNA analysis in ICOS-costimulated CD4 T cells. RNA was collected 24 h after stimulation with the indicated Ab-coated immunobeads containing suboptimal levels of anti-CD3. The expression of IL-4, IL-10, and IL-13 was examined by quantitative RT-PCR as described in Materials and Methods. Where indicated, 300 U/ml of IL-2 was added. The error bars indicate the SD of three replicates from one experiment, and the data are representative of three independent experiments. We and others have demonstrated that IL-2 addition partially overrides the CTLA-4-mediated blockage of CD28 costimulation (12, 13, 25). When IL-2 was added to cells stimulated with 3:7 ICOS/CTLA-4 beads, the inhibitory effects of CTLA-4 were completely abrogated. IL-2 addition greatly augmented both cytokine secretion and cell proliferation (Fig. 2⇑ and data not shown). Addition of IL-2 to cells stimulated with 3:7 ICOS/GLY beads also resulted in increases of cytokine transcripts, suggesting synergy between ICOS- and IL-2-mediated signal transduction (Fig. 2⇑). Thus, ICOS and IL-2 signals may act cooperatively to activate T cells in a manner that cannot be inhibited by CTLA-4 engagement. Because ICOS is induced after T cell activation (15), we postulated that engagement of CTLA-4 early in the cell activation process could block the actions of ICOS by preventing its cell surface up-regulation. To test this hypothesis, we stimulated resting CD4 T cells with either 3:7 ICOS/GLY or 3:7 ICOS/CTLA-4 beads for 24 h and assayed for ICOS surface expression. Consistent with this hypothesis, ICOS up-regulation was not observed in cells stimulated by the 3:7 ICOS/CTLA-4 beads (Fig. 3⇓). Because addition of IL-2 to cultures stimulated with 3:7 ICOS/CTLA-4 beads not only restored but greatly augmented cytokine expression (Fig. 2⇑), we reasoned that IL-2 addition would restore ICOS induction in the 3:7 ICOS/CTLA-4 stimulated CD4 T cells. 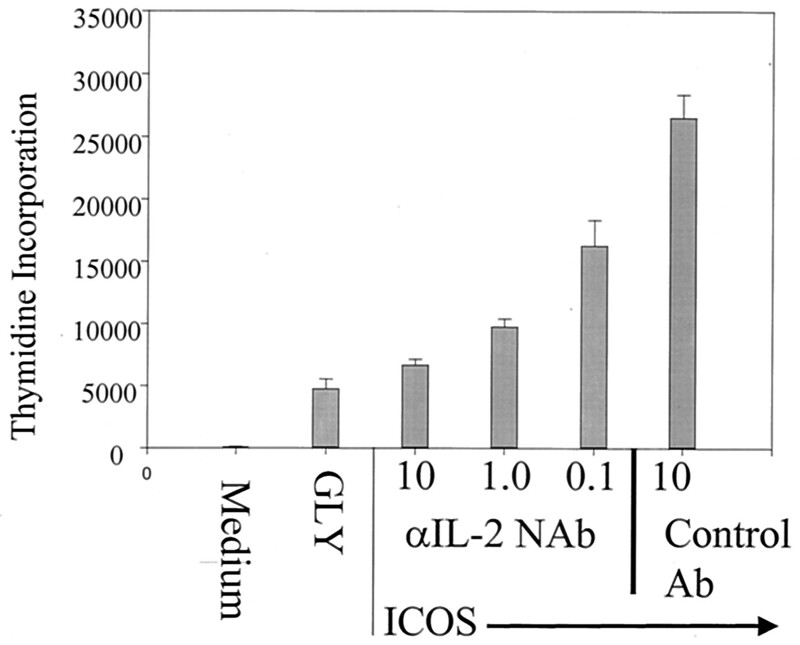 However, we observed only a partial recovery of ICOS expression following IL-2 addition. 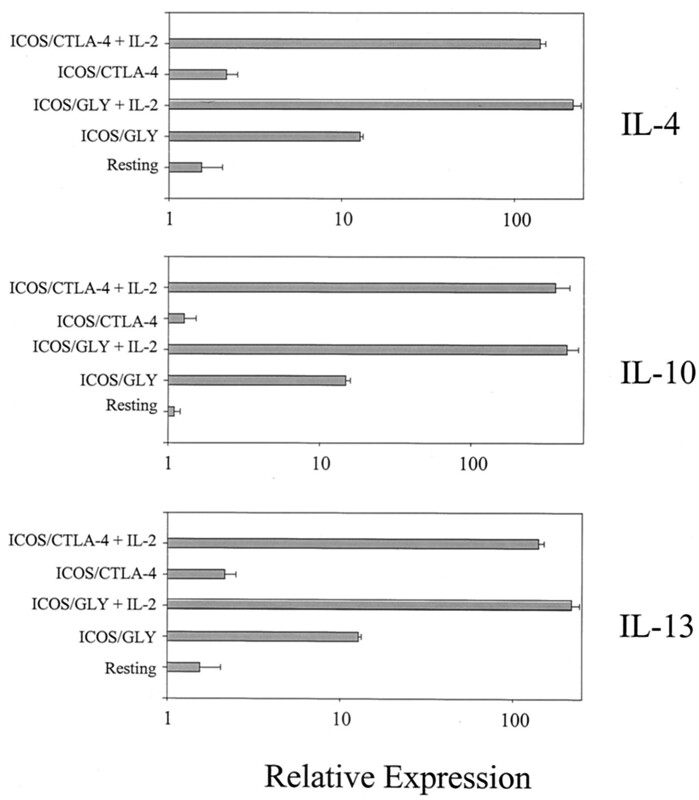 This is surprising given the enhanced production of IL-4, IL-10, and IL-13 observed upon addition of IL-2 to cultures stimulated with 3:7 ICOS/CTLA-4 beads (Fig. 2⇑). Additionally, while ICOS was initially reported to be absent from human resting cells (15), we detected low levels of ICOS expression on the surface of resting cells, confirming our recent studies in rat T cells (Fig. 3⇓) (21). Despite this low level of expression, we found no evidence of ICOS up-regulating its own expression as both 3:7 ICOS/GLY and beads just coated with anti-CD3 and GLY up-regulated ICOS expression on CD4 T cells equally (Fig. 3⇓A and data not shown). CTLA-4 engagement blocks the induction of cell surface ICOS. 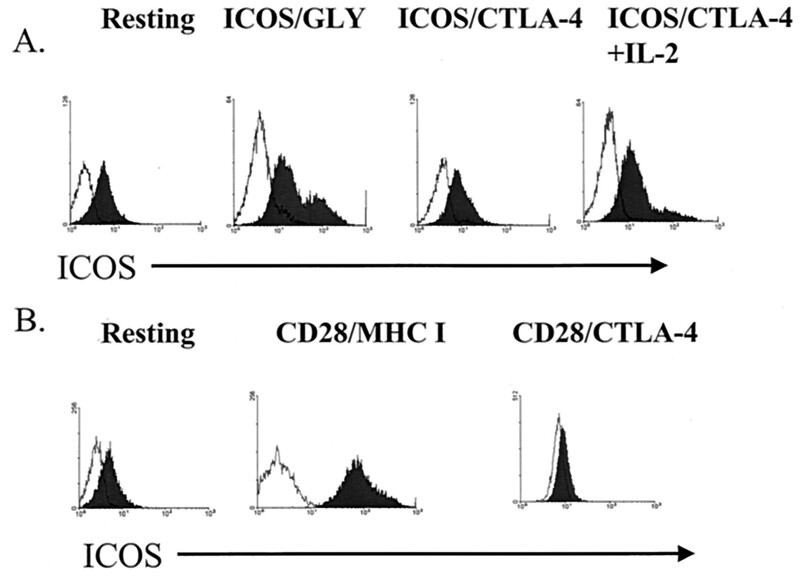 CD4 T cells were stimulated with 3:7 ICOS/GLY or 3:7 ICOS/CTLA-4 beads (A) or 1:9 CD28/GLY and 1:9 CD28/CTLA-4 for 24 h, and cytofluorometric analysis of ICOS expression (shaded) or isotype control (open) was performed. All beads contained suboptimal levels of anti-CD3. Where indicated, 300 U/ml of IL-2 was added. Data are representative of at least three independent experiments. CD28 costimulation induces expression of many cell surface molecules, including ICOS (15, 21). As shown in Fig. 3⇑B, CD28 costimulation induces high levels of ICOS expression on all CD4 T cells (Fig. 3⇑B). To test the effects of CTLA-4 ligation on CD28-mediated up-regulation of ICOS, resting CD4 cells were stimulated with 1:9 CD28/CTLA-4 beads and a matching 1:9 CD28/MHC I control. Because CD28 is highly expressed on resting cells, we used a binding control Ab (MHC class I). In cells stimulated with 1:9 CD28/CTLA-4 beads, no up-regulation of ICOS was observed, whereas high levels of ICOS were seen in cells stimulated with 1:9 CD28/MHC I beads (Fig. 3⇑B). These results indicate that CTLA-4 costimulation can block ICOS induction mediated by either CD3 or CD28 signals. To confirm these results and to gain insight into the regulation of ICOS expression, we examined ICOS mRNA levels by quantitative PCR and found a very close correlation between RNA level and surface expression (data not shown), suggesting that ICOS expression is primarily regulated at the RNA level. Because CTLA-4 engagement prevents ICOS up-regulation on resting cells, we could not determine whether CTLA-4 blocks ICOS signal transduction. 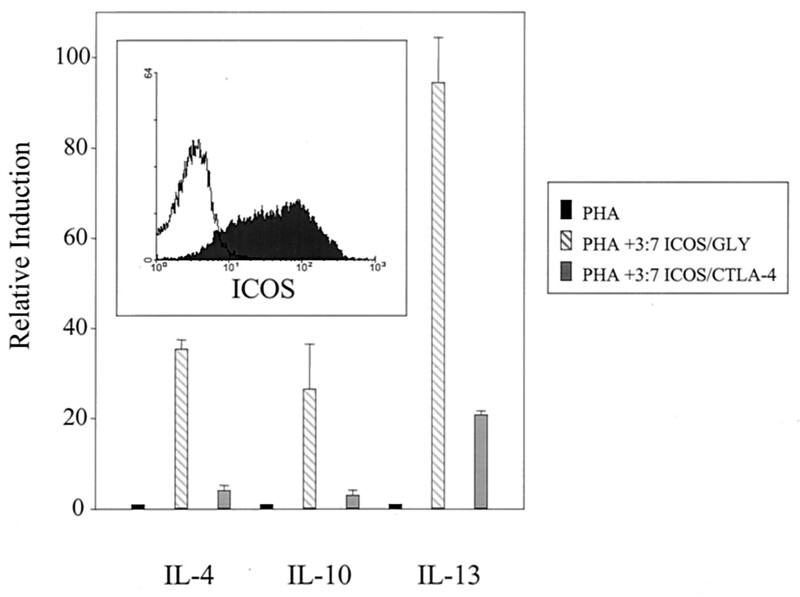 Therefore, we stimulated CD4 T cells with PHA and IL-2, which resulted in large increase in ICOS surface expression (Fig. 4⇓, inset). Cells were then washed several times to remove IL-2, restimulated with either 3:7 ICOS/GLY or 3:7 ICOS/CTLA-4 beads, and then harvested 6 h later. An increase in the transcripts encoding IL-4 and IL-10 was evident in cells stimulated with 3:7 ICOS/GLY beads but not in cells stimulated with 3:7 ICOS/CTLA-4. CTLA-4 ligation diminished, but did not completely prevent, induction of IL-13 by ICOS. Thus, even when high levels of ICOS are present on the cell surface, CTLA-4 engagement can block ICOS-mediated costimulation by interfering with ICOS’s signal transduction pathway. CTLA-4 ligation blocks ICOS costimulation on preactivated cells. 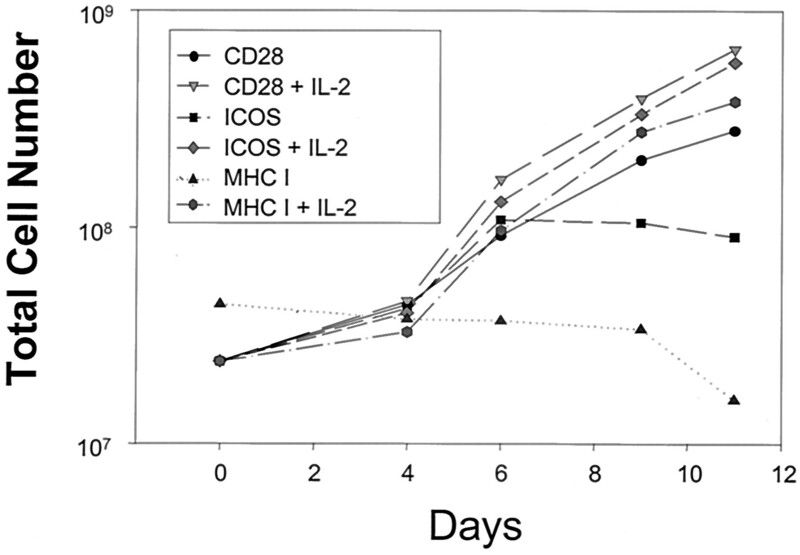 CD4 T cells were activated with PHA/IL-2 for 3 days to induce ICOS expression. ICOS (shaded) or isotype control (open) surface staining is shown in the inset. The cultures were washed several times to remove IL-2, and 3:7 ICOS/GLY or 3:7 ICOS/CTLA-4 beads were added for an additional 6 h before cells were harvested. Quantitative RT-PCR was performed to detect expression of IL-4, IL-10, and IL-13 as described in Materials and Methods. Data were normalized to the values obtained from the untreated PHA-stimulated T cell RNA. The error bars indicate the SD from one experiment, and the data are representative of three independent experiments. The dramatic ability of IL-2 to augment the production of cytokines from ICOS-costimulated CD4 T cells prompted us to further explore the relationship between IL-2 and ICOS costimulation. Although one group reported high levels of IL-2 production upon ICOS costimulation (20), most groups have reported undetectable levels of IL-2 in the supernatant (15, 19, 27). We also failed to detect IL-2 in the supernatant of ICOS-stimulated T cells (data not shown). However, because IL-2 is an important factor for CD4 T cell growth, we speculated that ICOS costimulation was producing small levels of IL-2 that were being consumed immediately by the ICOS-costimulated T cells and thereby not detectable by ELISA. To test this hypothesis, we isolated RNA from these cells and measured IL-2 transcripts using a quantitative real-time RT-PCR assay. The results show that 3:7 ICOS/GLY-costimulated T cells produce 30-fold more IL-2 mRNA than CD3 stimulation alone (Fig. 5⇓), suggesting that small amounts (relative to CD28) of IL-2 are made by ICOS-costimulated T cells. Interestingly, CTLA-4 engagement prevented the induction of IL-2 gene expression. ICOS costimulation induces low IL-2 mRNA levels, whereas CD28 induces high levels of IL-2. CD4 T cells were stimulated with beads coated with a suboptimal level of anti-CD3 and the indicated costimulatory molecule(s) for 24 h. IL-2 mRNA levels were determined by quantitative RT-PCR. Data were normalized to the values obtained by T cells costimulated by GLY and are representative of three independent experiments. 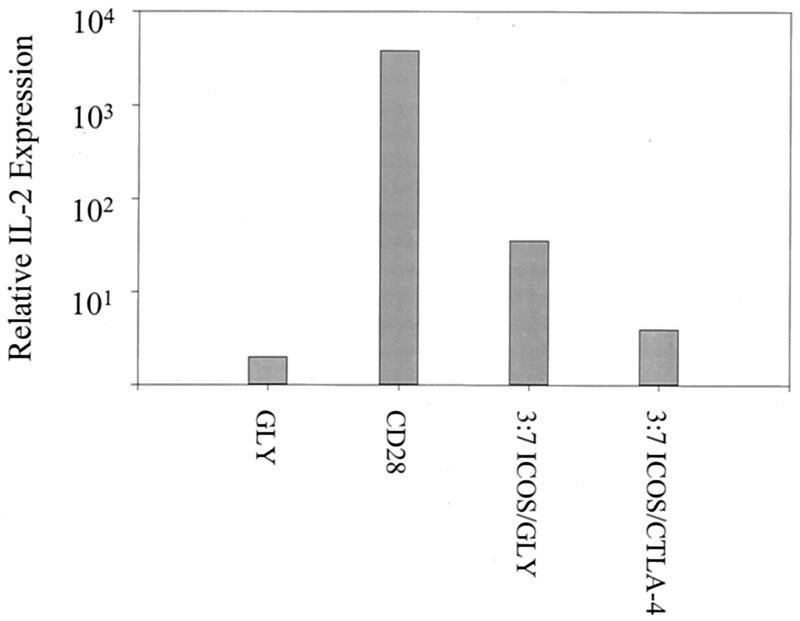 Supernatants of cultures costimulated with GLY, 3:7 ICOS/GLY, and 3:7 ICOS/CTLA-4 contained no detectable IL-2 protein, whereas the culture costimulated by CD28 contained 109 ng/ml of IL-2 (data not shown). To determine whether low levels of IL-2 are necessary for ICOS costimulation, we added neutralizing Abs to IL-2 to the culture and measured proliferation (Fig. 6⇓). A dose-dependent drop in cellular proliferation was observed in cultures treated with IL-2 Ab, whereas no effect was seen when a control Ab was added. Similar results were recently obtained by Yoshinaga and colleagues using a B7RP-1 fusion protein to stimulate T cells (27). These results indicate that ICOS-costimulated T cells produce small amounts of IL-2 that are immediately consumed by the T cells. Thus, IL-2 is required for induction of proliferation by ICOS. Neutralization of IL-2 prevents ICOS-mediated costimulation. CD4 T cells were stimulated with suboptimal levels of CD3 coupled with either GLY or ICOS. Neutralizing Abs to IL-2 (μg/ml) or an istoype control were added to the indicated cultures. [3H]Thymidine was added after 72 h of culture, and the cells were harvested the following day. Data are representative of two independent experiments. CD4 T cells require IL-2 for sustained growth and proliferation (28). The minimum quantities of IL-2 produced by ICOS-costimulated T cells prompted us to investigate whether these cells were capable of sustained proliferation. T cells costimulated by either anti-ICOS or anti-CD28 accumulated at equivalent rates for the first 6 days after stimulation. However, after that point, the ICOS-costimulated culture stopped growing, whereas the CD28-costimulated culture continued to expand in agreement with our previous results (6) (Fig. 7⇓). We saw no synergy between CD28 and ICOS costimulation, as cells costimulated with ICOS and CD28 (5:5 ICOS/CD28) grew as well as those costimulated with CD28 (data not shown). Exogenous IL-2 is required for sustained growth of ICOS-stimulated CD4 T cells. CD4 T cells were activated with beads coated with suboptimal anti-CD3 and the indicated costimulatory molecule. Where indicated, 300 U/ml of IL-2 was maintained in the culture throughout the experiment. Data are representative of least three independent experiments. To gain a better understanding of why ICOS-costimulated T cells could not sustain long-term growth, we analyzed the cells for apoptosis. No differences were seen during the first 7 days; however, after that, we saw a rapid induction of apoptosis that coincided with the lack of T cell expansion (Table I⇓). The addition of IL-2 to the ICOS-costimulated cultures prevented the increase in apoptosis and permitted long-term growth term expansion equivalent to that seen with CD28 costimulation (Table I⇓ and Fig. 7⇑). Thus, ICOS costimulation is able to provide the necessary proliferative signals to start cell division, but does not deliver the survival signals needed to maintain long-term growth. The use of Ab-coated beads as artificial APCs has limitations as a model system due primarily to the use of Ab instead of natural ligands. However, we and others have found it to be useful system for analyzing the interplay between different costimulatory molecules due to the ease in which signal strengths can be manipulated (11, 13, 14). Using this system, we show that CTLA-4 ligation can block ICOS-mediated costimulation by preventing up-regulation of ICOS on the T cell surface and interfering with ICOS signal transduction. The addition of IL-2 to the culture overcame this inhibition and, in fact, augmented cytokine production, consistent with the hypothesis that there is synergy between the ICOS costimulation and IL-2. We also found that ICOS costimulation produces a small quantity of IL-2 that is necessary for proliferation but insufficient for sustained growth. The role of CTLA-4 as an immune attenuator is clear, yet the mechanism through which it acts remains to be elucidated. Because CTLA-4 inhibits IL-2 production and cell growth, it was initially postulated that CTLA-4 blocks the actions of CD28 (29). Subsequent work using CD28−/− mice showed that CTLA-4 engagement still blocked T cell responses against a cardiac allograft, suggesting that CTLA-4 engagement could inhibit additional costimulatory pathways (30). Given the potency with which ICOS activates T cells in CD28−/− mice (31), it is likely that ICOS costimulation is sufficient to mediate allograft rejection. Thus, our in vitro results demonstrating that CTLA-4 blocks ICOS costimulation are compatible with the in vivo data showing that CTLA-4 ligation blocks cardiac allograft rejection in CD28−/− mice. The observation that CTLA-4 engagement can prevent the up-regulation of ICOS may be relevant to other inducible costimulatory molecules such as OX40 (32), 4-1BB, (33), and CD40 ligand (34). It is possible that CTLA-4 engagement prevents the up-regulation of these costimulatory molecules, representing a global mechanism in which CTLA-4 ligation prevents T cells from becoming activated. The interplay of costimulatory molecules determines whether an APC–T cell interaction results in T cell activation. CTLA-4’s blockage of CD28 and ICOS signals requires a high CTLA-4:CD28 or ICOS ratio and can be overcome by lowering this ratio (12, 13, 25, 26). This suggests that the role of CTLA-4 could be to serve as a global attenuator of the immune response by raising the threshold of T cell activation (11). This would prevent weak APC–T cell interactions from activating the immune system, thus, minimizing the potential for autoimmune disease. What is the role of ICOS in the immune system? Based on the cytokine profile of cells stimulated by ICOS as well as in vivo data showing high ICOS expression in B cell areas of lymph nodes, it was suggested that ICOS costimulation promotes a Th2 phenotype (15). Other reports show that the ICOS is crucial for all CD4 T cell responses in CD28-deficient mice, suggesting that ICOS serves a redundant role to CD28 (30). Our data, coupled with the B7RP-1 expression data, suggest that ICOS can initiate but not sustain an immune response started by a nonprofessional APC. B7RP-1 is constitutively expressed on B cells and can be induced on other nonlymphoid cells by TNF-α (18, 35). Immature dendritic cells, in contrast, express low levels of B7RP-1 and, upon maturation with LPS, B7RP-1 is no longer detectable, suggesting that nonprofessional APCs at a site of inflammation may be the highest expressers of B7RP-1 (20). By adapting the model of Thompson and Allison, (7), we would argue that CTLA-4 would outcompete CD28 for binding to this low level of B7-1 induced on nonprofessional APCs and it would not be sufficient to activate T cells. Likewise, if only low levels of B7RP-1 are induced, CTLA-4 engagement would still prevent ICOS-mediated T cell activation and a possible aberrant immune response. However, if high levels of B7RP-1 are induced on the cell surface, costimulation through ICOS would override this CTLA-4 blockage and induce T cell proliferation and secretion of effector cytokines. Moreover, as we have pointed out here, ICOS costimulation would not be able to sustain the T cell response by itself and would either need CD28 costimulation through a professional APC or exogenous IL-2. Thus, ICOS costimulation could initiate the immune response but could not sustain this response without IL-2 created from a professional APC–T cell interaction. The studies presented here reinforce the complex nature of the T cell response. The immune system has established numerous checks and balances to the T cell response to ensure both a prompt and focused response to a pathogen while preventing autoimmune disease. Our results suggest that ICOS’s main role is not to promote a Th2 response, but rather to initiate T cell responses from nonprofessional APCs in the periphery. We thank Drs. Richard Carroll, Ken Frauwirth, Jeff Rathmell for insightful discussions and a careful review of the manuscript, and Eric Eppler and Brian Hudson for technical assistence. We also thank Dr. Beatriz Carreno for generously providing the anti-CTLA-4 Ab. ↵1 This work was supported by the Abramson Family Cancer Research Institute. ↵3 Abbreviation used in this paper: GLY, anti-glycophorin A Ab.